Whenever a brand reaches out to see if we want to take a look at a new watch, I generally start from a position of “yeah, why not?” In other words, the watch is innocent until proven guilty. Sure, there have been some, shall we say, less-than-preferable pieces crossing the review desk with that policy. By and large, however, the time spent under that policy has been favorable, and resulted in the time that I got to spend with the Aevig Corvid. 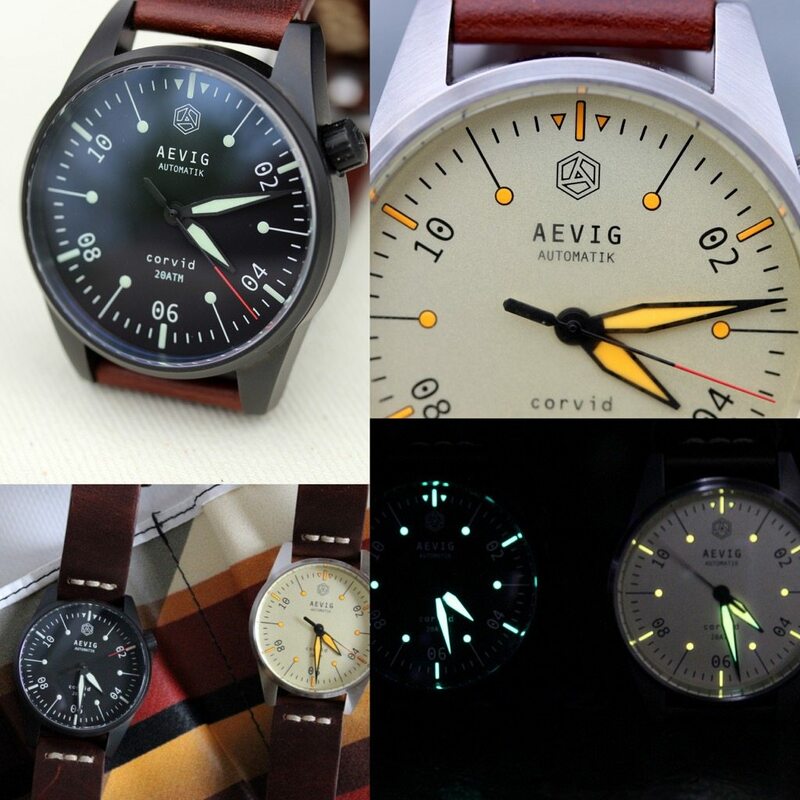 Now, for those who follow with great detail the various smaller brands out there, Aevig should be a familiar name. And, you might even say that the Corvid itself is nothing new. But you see, friends, this Aevig Corvid is indeed new, as it’s showcasing the brand moving this watch into the world of automatic movements. Now, you might think, for a smaller brand, we’d have the expected Miyota, or maybe even a Seagull for the particularly cost-conscious. For the Aevig Corvid, that simply would not do. Instead, we’ve got the Swiss STP 1-11 automatic movement. For those not down into the details like Victor is, the STP 1-11 is a Fossil-backed answer to the ETA 2824 (more on that here), which should translate to a robust movement. Of course, if that movement is tucked away in a bowl of dog food, no one is going to care. As you can tell from the photos, this is as far from the reality as could be. While the brand calls this a Bauhaus-inspired field watch, I’m leaning towards it being more of an aviator (with those hands), or a just plain, all-around everyday sort of watch, with some military influences. So, yeah, field watch will work. The printed dial is fairly stark, but I really dig how you have the lollipop indices popping in there at the odd hour markers. Forget where 12 o’clock is? Well, don’t look for the big arrow head. No, look for the double (two! two for the price of one!) arrow heads flanking the 12 o’clock indice. This looks nice and crisp in the white on black variant (which we saw in the the PVD-coated case). For me, the star of the dial show came with the champagne dial (which I don’t normally go for) with the orange painted hands and indices. You see, the orange is lume (as you would hope), and based on the contrast between the paint and dial color, as well as the fact that the lume just wants to glow if you hit it with a little bit of sunlight, you get a very fluorescent look to things. Now, this might sound like a hit against the Aevig Corvid, but I found it worked great. Having that daytime illumination going one was just lovely. And it’s a subtle effect (if you prefer something less subtle, there is also a full-lume dial). Another tweak that I thought was quite nice (and setting the watch on its own) is the crown being up at 12 o’clock. We’re used to crowns at 3, 4, and even 9 – but up at 2, that’s not as common. As with any other crown position that is not at 3 o’clock, this brings along added comfort for your wrist. Oh, and speaking of comfort – the straps on the 94g Aevig Corvid were amazing. You hear things called buttery smooth, and these straps are the very definition. Super-soft, they immediately mold to the wrist. The have a great look right off the bat, and just the little bit of wear I had on them, they were getting some lovely patina and wear marks. I can only imagine these straps would be a-mah-zing after a year or so of wear. The one surprise here is that the strap is only in brown. While it works with the black case, a black strap would have been a bit more coordinating. Who’s it for? You are searching for a great everyday watch that takes some well-known design cues and mixes in some elements that are decidedly Aevig. Oh, and brings along a Swiss automatic at a very affordable price point. Would I wear it? Yes sir, indeed I would. What I’d change: Shaving a millimeter or two off the height is always welcome. Past that, a darker/black strap option f the DLC cases. The best thing about it: The whole package, dear reader. The whole package.